"Big City Is For Me"
Jazz vocalist Ariane Jacobi has developed a distinctive song styling. She captures melodies with the huskiness of her voice: bouncy and effortless - full of rhythm. Ariane Jacobi is one of those singers who can shape melodies as well as lyrics into a believable story. Her warm voice and her sincere interpretation makes it possible to weave a spell of sadness, love or just plain “snap your fingers” mirth. 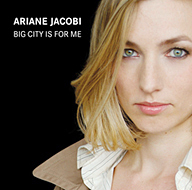 When you listen to Ariane Jacobis debut album “Big City Is For Me” you will also hear her skills in phrasing and her swells on notes, capabilities which may remind you of jazz personalities like Billie Holiday or Anita O´Day at times, but, the form they take is her own: such as the manner in which Ariane Jacobi stresses certain words and even the breath itself. “ Since I was little, I loved old school blowers, especially tenormen, like Pres, with his fragile, intensive sound, his rich melodic ideas, and I was bewildered by Ben Webster´s meaty tone, his vibrato and the air at the end of the notes” Ariane said. With “Big City Is For Me” Ariane Jacobi offers an album with tunes from the American Songbook. The title of the CD comes from the tune “Big City” by Marvin L. Jenkins, a composition which is the soulful opener of this album. From the very beginning Ariane makes something cool out of it, while singing the words “There´s no place on earth where I´d rather be”. Raised in Cologne, she knows what she´s talking about. When you listen to Frank Jacobi, the man on alto, bouncing around inside the song and developing energetic bebop ideas, you´ll find the atmosphere of this urban everlasting partying feeling. But later on you can slow down when Ariane Jacobi leads with her big beat through Peter Nero´s tune “Sunday In New York”. Take your time and have a listen to Olaf Polziehn´s piano solo which shows, that he is rooted in the Oscar Peterson tradition but able to play everything. On James Van Heusen´s “Imagination” and also on Duke Ellington´s “Do Nothing Till You Hear From Me”, Ariane Jacobi seems to get lost in the lyrics, in the feeling of loneliness. Tenorman Frank Jacobi, who´s blowing all the horns (flute, clarinet, alto, tenor and baritonesaxophone) on the album, is right into this “my empty arms are holding a dream” intimacy. To get in the blues mood for Sigmund Rombergs “Lover, Come Back To Me” Ariane Jacobi starts the tune with the seldom played verse. Then she is backed by a drummer- and hornless combo: This way she refers to the Nat King Cole Trio. Guitarist Rolf Marx swings with his singing tone while pianist Olaf Polziehn and bassist Ingmar Heller are on their virtuoso solo flights: Solos which sound as if they were compositions on their own. “Fasten your seat belts” Frank Sinatra once said before he sang his vivid version of “Come Fly With Me”, a song which becomes a personalized lightly swinging tune in Ariane Jacobi´s hands. Drummer Joost van Schaik supports this easy atmosphere in all mid tempo tunes like “Day In Day Out” or “I Could Have Danced All Night”, the tune from the musical from “My Fair Lady”, that surprises with its charming and witty “teatime flair” arrangement of Torsten Maas. When Ariane Jacobi, the blonde, attractive and tall lady sings her edgy “Hallelujah, I Love Him So” or “All the boys in town are crazy about me…I keep a pocket full of money for fun” sentences from Ray Charles´ “The Ego Song” she flirts with her crisp sound and with her sense of humor. So: Open your ears for Ariane Jacobi!